Five classes will be competing for six championships this Saturday night. Live band following the races. SPRING VALLEY, MN – August 20, 2014: The great folks at Jaguar Communications and Apollo Wine & Spirits have put together an action packed championship night. This Saturday history will be made as five track champions are crowned along with the first ever Ethanol Cup Champion which is set to pay out $5,000 to the top ten drivers. The hard work in the off season and the dedication during the season has all comes down to this Saturday night. 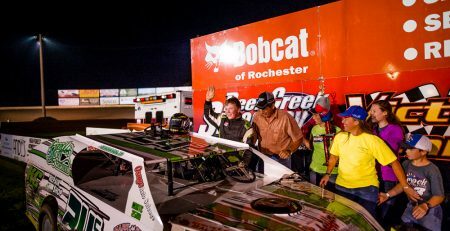 Fans are guaranteed to see one of the most epic points championship nights at Deer Creek Speedway as some of the tightest point battles in the history of the speedway will be settled under the lights at the Southern Minnesota Speed-plant. The tightest battle for a division championship belongs to the WISSOTA Super Stocks as multi-time track champion Jeff Brauer is tied with Gary Wiersgalla who is seeking his first ever championship at The Creek. But track titles are not the only titles on the line. Saturday night will also decide the first ever Ethanol Cup Champion at Deer Creek Speedway. This unique program was designed as a separate championship title that allowed all five weekly divisions to duke it out against each other for one stand-alone title, and of course bragging rights. There are three drivers from three different divisions in arms reach of the title going into the final night of the Dash for the Ethanol Cup. Mike Blowers, driver of the #34 WISSOTA Street Stock currently sits in third place only 11 points out of the top spot and fans can be certain he will do what he can to capture the title. Cole Queensland, driver of the #20 USRA B-Mod and Jeff Brauer, driver of the #34 WISSOTA Street Stock will enter the final event tied for the points lead. Before the heroes of the high banks get a chance put the final chapter to the season the little cars will climb in their cars as the Truck Country Slingshots are scheduled to start on Button Buck Speedway shortly after their 2:30 pit meeting. Don’t forget the Slingshot portion of the event is FREE to watch from the grandstands. 2:30 Truck Country Slingshot Pit Meeting followed by racing on Button Buck Speedway. 3:30 Driver entry opens for Deer Creek Speedway drivers. USRA Modifieds, USRA B-Mods, the WISSOTA Super Stocks, WISSOTA Midwest Modifieds and the WISSOTA Street Stocks. 5:30 Draw cut off followed by hot laps. 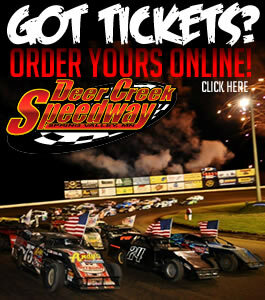 For more information, visit DeerCreekSpeedway.com or “LIKE” our Facebook Page. You can also follow us on Twitter @DeerCreekSpeed (#TheCreek) or on our YouTube channel. RaceWise Is Back To Help You Out Run Your Competition!